When Mazda debuted the 2019 Mazda 3 at the Los Angeles Auto Show last year, Motor Trend reported that the company’s new Skyactiv-X engine with Spark Controlled Compression Ignition technology would go to countries with stricter emissions rules first, and the U.S. market would get it later. Now it seems we finally have an idea of the performance of the engine, at least in some markets. According to a spec sheet from Mazda of Slovakia, which you can view here, the Skyactiv-X engine will put down 181 metric horsepower, which converts to roughly 178.5 mechanical HP, and 222 nm of torque, or roughly 163.7 lb-ft of torque. The documents don’t give any indication of displacement for the engine, but the Skyactiv-X prototype we drove back in 2017 was a 2.0-liter. 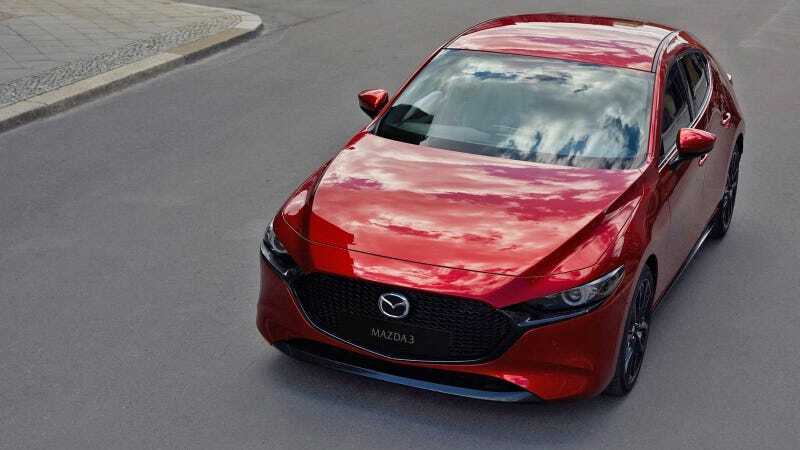 Compare the figures above with the 2.0-liter Skyactiv-G engine in the outgoing Mazda 3, which produces 155 HP and 150 lb-ft, and the 2019 Mazda 3 with the 2.5-liter Skyactiv-G, which makes 186 HP and 186 lb-ft of torque. According to internal Mazda documents sent by Jalopnik by an anonymous tipster, the Skyactiv-X will be offered on the higher GT and GT Plus trims with manual and automatic transmissions both available. The option of all-wheel drive will only be available on hatchback models. We’ve reached out to Mazda for confirmation on these details and we’ll let you know if we find out anything else. Keep in mind Europe is a much different market than ours, so any configuration sold overseas may not be what America gets once the Skyactiv-X becomes an available engine option for us, whenever that is. At dinner during the 2019 Mazda 3 first drive, Masahiro Moro, president and CEO of Mazda North America, told journalists that the company may still be exploring the full potential of the new engine technology, so we may see different performance specs when the engine finally makes it our way.